The collect and readings for the Fourth Sunday in Lent may be found here. The following sermon is based on Numbers 21:4-9 and John 3:14-21. When I drive to Corpus Christi I usually stop at a little rest area alongside interstate 37 about 85 miles north of Corpus. 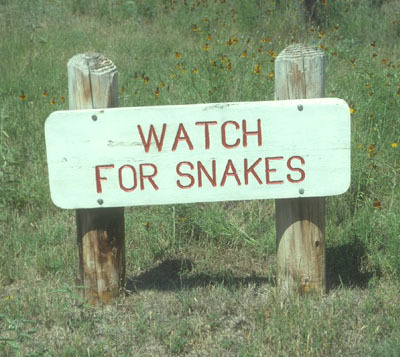 As you exit the interstate and follow the ramp up to the rest area one of the first things you notice are two signs that say, “Watch for snakes.” It is a warning that there are dangerous things out there that can bite you, hurt you, maybe even kill you. So we are told to avoid the snakes and if you see one get away. That makes sense. It’s good advice. It is, I suspect, how most of us try to live our daily lives. And it’s not just about the snakes that crawl on the ground. We live that way with regard to the snakes of life. We avoid those things we fear, the things that hurt us, that bite us and cause pain – not just physically but also emotionally and spiritually. So we avoid dealing with our addictions and attachments. We ignore broken relationships. We put off doing the hard work of life. We turn away from our difficulties. We repress painful memories. We don’t acknowledge our fear, resentments, or anger. We refuse to think or talk about our own death. We deny the things we have done and left undone. After all isn’t that what the sign says? If you see a snake get away. What if there was a different sign? What if the sign said, “If you see a snake look him straight in the eyes. Stare him down. See who blinks first.” It sounds kind of crazy but at some level that’s exactly what God told the Israelites to do. Their impatience in the wilderness, their fear of dying, living with an uncertain future and an unknown destination, the emptiness, thirst and hunger, the difficulty of life – all manifested themselves as snakes in the wilderness; snakes that would bite, wound, and kill them. They would have to face the reality of their snakes. It seems like a smart Israelite would turn and run. But when the Israelites tried that they died. We are not saved from our snakes by running away. God offers a different option. Instead of turning away, the salvation God offered the Israelites was that they were to stare at the very thing they feared. God’s ways are not our ways and God’s thoughts are not our thoughts. God’s logic often seems foolishness. Somehow authentic life involves facing and looking at the reality of death – not only our own physical death but also the many ways we die each day. The daily deaths happen in various ways – in our disappointments, failures, and shattered dreams; in our regrets and sorrows; our loneliness; our anger, fear, and resentment; the losses and broken relationships we experience; the separation and isolation caused by sin. The place of fear becomes the place of courage. The place of sin becomes the place of forgiveness. The place of wounding becomes the place of healing. The place of death becomes the place of life. The place of falling down becomes the place of rising up. The very things that destroy life in the human world are, in God’s world, the instruments of healing and salvation. In God’s world the cure for snakes is a snake, the cure for human life is God’s incarnate life, and the cure for death is death. This holy season of Lent asks us to discover and name the snakes of our life. And then decide. Will we turn and run or will we turn and gaze? Lifting our eyes to meet the gaze of love, the gaze of Christ? I’m totally making a sign that says, “If you see a snake look him straight in the eyes. Stare him down. See who blinks first.” and putting it on my desk! What a great sign. I love it! Thank you. I’ve found that we have another bad habit- we stare down other people’s snakes, and pretend we don’t have any. It’s so much harder to stare down your own personal snakes. Yes, self reflection and examination are necessary and difficult work. I am grateful for those who help hold me acceptable to do my work. Great post Mike. I wonder to what extent dualistic thought has simply taught us to deny, ignore, or oppress these very things you mention forgetting that our healing lies hidden in a discerning engagement with them. Hidden in the path to the cross is also the path to resurrection. The two are inextricably linked. Dualism has a hard time with this. Loved the way you worked with the text here. Don, I like your wondering and thoughts about dualism. Dualism, it seems, pushes us into rationalism, linear thinking, and seeking a resolution. The non-dualistinc mind can sit with paradox, trust mystery, and know by unknowing. As you rightly point out the cross and resurrection are not opposed to each other. I am always appreciative of your encouraging words and your good thoughts that expand and clarify what I am trying to say. Thank you. Eve too must be saved by the Serpent!